Wet Wire? GEO air wipes dry your wire completely with compressed air! For the drying of wire, strand and small tubes GEO developed a stainless steel air wipe, which guaranties optimal drying with low air consumption even at high process speed and rough handling. A surface is dried by an airstream, which is lead through a helical teflon body inside the nozzle. The airstream is accelerated, pushed into rotation and blown against the material running direction. This causes an enormous shear impulse on the interface between the profile surface and the water. It exceeds the interfacial energy of the adhering fluid. Alternative methods are clearly outclassed. The stainless steel body of the nozzle is resistant to aggressive agents, unlike the usual plastic jets. It features protective ceramic inserts for bare wire applications and can be completely dismantled. Worn or broken pieces can be replaced. 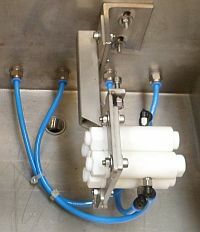 The compact design fits easily into compact process lines. The air wipe model AW-C is available in seven sizes for wire diameters from 0.5 to 17 mm. Special designs e.g. with stainless steel insert and special forms made of plastic material complement the range of GEO‘s air wipes. For the drying of strips, profiles and pipes custom designs are available upon request.